Objective: To investigate stress at work and work perceptions among occupational and physical therapists during the implementation of the global budget payment system of the National Health Insurance. Factors affecting stress and work perceptions were examined. 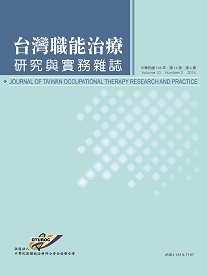 Methods: A cross-sectional study with a stratified and proportional random sampling in Taoyuan was used to obtain the sample. Two questionnaires with acceptable reliability and validity were used. One questionnaire measured the change of work perceptions before and after the global budget for medical employees (WPGB) and the other questionnaire measured medical workers stress (QMWS). Sampled therapists were invited to participate and fill out the questionnaires. Results: From July to December 2006, 97 valid questionnaires were obtained (29 occupational therapists, 68 physical therapists). The total score of the QMWS was 32.07 7.35, and the percentile was 66.8. The first three items of QMWS were how they face medical disputes, receive pay (salary), and prepare work for hospital accreditation. The total score of the WPGB was 31.23 3.48, with a percentile of 69.4. The first three items of WPGB were salary, workload, and treatment quality. Dissatisfaction with their salaries was as high as 50.5%. The intention to quit (sometimes, often, always) was 50.4%. The salary satisfaction and intent to quit was negative correlated (= -.38, < .001). Marital status, WPGB and work type were the significant factors of QMWS. Work position, salary satisfaction and intent to quit were significant factors of WPGB. Conclusion: During the implementation of the global budget payment system, occupational and physical therapists had adverse work perceptions, were dissatisfied with their pay, felt increased stress, and had high intention to quit their jobs.